1. Cut a silhouette shape or shapes from your cardboard or piece of rubber inner tube with a scissors or other suitable tool. 2. 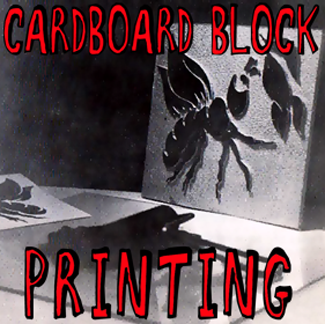 Glue the cardboard or rubber shape or shapes firmly to a piece of wood or heavy cardboard. Press under heavy books or some other weight to make sure that the shapes are flat. 4. When the ink roller (brayer) is evenly coated with ink, roll it over the surface of the prepared block. Make sure that the roller makes complete revolutions to thoroughly coat the raised surfaces of your block. 5. Lay your paper on a pad of newspapers or magazines and print the block. Exert heavy pressure for a good print. Standing on the block will assure adequate pressure. NOTE: This technique is especially suitable for making greeting cards, posters, Christmas cards, and bookplates. It may also be used with permanent printing inks or textile paints to print textiles.